What Keeps Living Community Thriving? Being among young communards, elders in the movement, and aspiring community builders I have witnessed what can make community living thrive and what can cause strife. Having an interest in community building and social dynamics as well as being immersed in the ecovillage/ intentional community movement for the past six years I gleaned what I have found to encourage successful community building (a great resource is “Creating a Life Together” by Diana Leafe Christian). I think it starts with a stable and well-thought foundation and it requires certain aspects that I will cover in the article below. 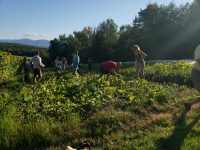 I will often be referencing the ecovillage La Cite Ecologique of New Hampshire as I have been spending ample time here and have seen this 35-year old (second generation) community thrive in so many ways. According to the Gaia education model (the renowned organization that certifies ecovillage courses around the world), there are five dimensions of sustainability; ecological, social, economic, worldview/ cultural, and whole systems are the center. Although there are many communities/ ecovillages that are pivoted around one of these aspects it still becomes obvious that the others are necessary to hone as foundational structures of the community to thrive. The first step of identifying the focus[e]s of said community is crafting the mission, vision, aims, and goals of the core people. I cannot emphasize how important it is that the community members are equally invested, inspired, and dedicated to the mission, vision, and aims of a project. Even years later La Cite NH consistently reviews these in order for the new members and experienced members to be on the same page and have input on the evolving text. Incorporating strong ethics and a motivated dream is the breeding ground for a resilient social sphere in an intentional community. When members spend time aligning in this way a “glue” is formed that encourages longevity in the project even during the roughest points. Talking to the elders here at La Cite and at other elder communities like, Synergia Ranch in Santa Fe New Mexico, they often refer to the vision that kept them going. For La Cite that was a regenerative education for their children for generations to come. For Synergia Ranch, a community of 45 years, it was the culmination of the biosphere project which was a giant dome in Arizona with seven major biomes replicated inside. It has been so inspirational for me to spend time with elders in these projects that dedicated over 30 years crafting the unthinkable because of their dedication, commitment, and fearless dreaming together. Although I may be biased because of my love for social dynamics, I do want to emphasize the other dimensions of sustainability referenced above. Intentional communities are sustained and fulfilled by working collaboratively. Most of the time this is either by creating goods, produce, or services. Their creations will be beneficial if they can sustain themselves and/or produce for their larger community. This brings up the focus on the ecological and economic sectors. At La Cite their mission “To develop an ecovillage that gives priority to education and sustainable development based on respect for all living things.” translates directly into their production of farm to table foods which they feed their community with and their businesses that correlate to spiritual, environmental, and physical well being. Talking with the Programs Director, Leonie Brien, about social entrepreneurship I learned the stark difference between a corporate business model and a “community” or “social” business model. In a social business model community becomes the central piece. Everything from the items produced/purchased to how the employees are treated is brought back to the core values and mission of the community. In La Cite this type of enterprise has created solar install companies, spiritual items distributions (Kheops), large wood recycling companies, and much more. Lastly, the element that makes or breaks community that I have witnessed; incorporating new members. I have been to a handful of intentional communities that are over 30 years old. Each time I have learned that a community has reached this age range I have been in awe. Diana’s book, “Creating a Life Together” emphasizes that most communities will fizzle out after two years for a multitude of reasons (some touched on above). So, regardless, reaching three decades or more is a feat but I find the point of creating long term communities are to recreate a sustained longevity. This alludes to much longer than a few decades. Unfortunately, once the elders in the communities become mentally or physically exhausted many of these elder communities peter out in energy and numbers. Two communities I have witnessed that are able to incorporate new members are Twin Oaks (fifty years old) and La Cite. They both have extremely different models and cultures but they both share something in common. They both emphasize the value of weaving in new members. They are able to do this by having a strong foundation based on monetary security and core roles defined. They also both value time spent together; preparing and eating meals as a community on a daily basis, dance parties, work parties. Creating a culture is most valuable to these people. Something that has stuck out to me about La Cite, unique from any other ecovillage, is the ability to value their youth. Starting as a little child these children are encouraged to dance on stage, hone their creativity, and have conversations with guests. When they have a dream they are given the tools and then encouraged to create business plans, build horse barns, aquaponics systems, you name it. They give their youth everything they need to feel confident and grow with ethics and good education. Their only ask as the community is to work two years for the community, where ever needed, when they turn 18, a way to thank the community for their upbringing. There are many aspects to building a strong, sustained community. I have only touched the surface but my intent is to leave you with resources and working examples so that you can witness building community. I hope that you visit these magical places named above and afterward consider joining or look into the resources given to create your own idyllic place.